You must be a member of the Singapore Traveling Group to attend this activity. Would you like to join this group? Looking for 5 more people to join us on this epic trip to Lake Baikal on Trans-Siberian Train for 13 Days, from 1 to 13 Mar Protected content . Nestling in the mountainous Russian region of Siberia, north of the Mongolian border, is the ancient deepest and most voluminous lake on earth – the magic of winter Lake Baikal. Lake Baikal conspires with mother nature to transform itself into an open icy playground at this time of the year, eager to flaunt it’s crystal clear blue ice to reflect its purity; rendering mercy to hold you on its solid surface, permitting audacity to drive across its frozen lake and regale you with amazing patterns of various cracked lines, crystal-clear ice with piled up floes on huge ice shield and beautiful bubbles beneath as you glide and frolic on it. 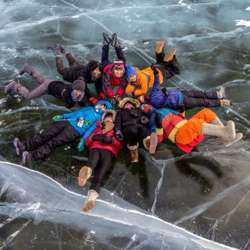 Not being alone, grotto neighbor are also not shy to enthrall you with beautifully decorated icicles for million photo shoot with dramatic landscape of this incredible winter lake. And let the epic Trans-Siberian Railway transport you from the terminus Vladivostok, Far East's most dynamic, fast-paced and the major Pacific port city in Russia overlooking Golden Horn Bay, near the borders with China and North Korea!